Meghan Markle declares her love for Harry with her M & H necklace from The Right Hand Gal. I first noticed The Right Hand Gal jewelry at James boutique on Sherbrooke Street. I had the kind of reaction that was part falling in love, and part panic (the good kind). I needed to have one of their colorful candy-like treats, and as soon as possible. Apparently I am not the only one who has had that reaction. The soon-to-be Princess Meghan Markle commissioned their mini-initial necklace. Heather Graham, Emily Blunt, and Olivia Wilde are all fans of The Right Hand Gal’s casual luxurious jewelry. Jewelry that’s made right here in Canada, by the unstoppable force that is sisters Randi & Shawna Herlich. I was thrilled to chat with them about their business and design process. I found them to be as fun as their jewelry. They are hard-working, inspired, and focused on empowering women one “magic” ring at a time. The Right Hand Gal lookbook is stunning. Check out their jewelry & purchase on-line here. The cozy sweater cafe: How did you two get started? The Right Hand Gal: We started planning the company seven years ago. We were personal shoppers and whenever we would try to find jewelry for our clients, we could only find Cartier or costume jewelry, and nothing in between. We decided to start a business that filled that void. We wanted to create real luxury jewelry that you could buy yourself and wear “from the gym, to the red carpet”. CSC: Do you make everything yourselves? RHG: For the most part yes, it is all made by hand right here in Canada! We do have someone that sources the stones for us and sometimes that can take up to a year. CSC: Tell me about your design process. RHG: It usually begins with an idea that pops in our head in the middle of the night and we quickly sketch on a notepad. By 7 am we are texting each other and getting ourselves all excited. It really is that middle-of-the-night idea that we work on until we are able to recreate it. Shawna (in charge of production) works with someone who creates the sample until we get it looking like we saw in our head. CSC: Do you take custom orders? RHG: We do “semi-custom”. We stick to our designs, but if you want to use a different stone, we can mix and match for you. You can buy the jewelry directly from our site! CSC: You mention that “the left hand is reserved for the misters, and the right hand is reserved for the sisters”. I love that. What does it mean for you? RHG: We believe very strongly in empowering women, all our work has been focused around that. We want women to feel beautiful and confident. It is all part of having the confidence that comes from being able to take care of yourself. CSC: Is it as fulfilling as I think it is to have a successful and creative business with your sister? RHG: We are very best friends and could not imagine working with anyone else. Seeing something come to life from your head to real life is a very exciting process. Our language is jewelry so when someone loves our jewelry, it’s like they understand us. It is a dream; the whole business is a dream. The great thing about having a business with family is the unconditional love, no matter what happens, even if things get stressful, even if you disagree, the next day it’s forgotten. You can have stressful moments and then the next minute it’s “Can you pass the ketchup?” We love each other so much that no matter what happens, we move past it quickly. I would say we are unbreakable! CSC: How have you been able to get your jewelry noticed by celebrities? RHG: We actually never went directly to any of them. With Heather Graham, it was through someone we knew who asked if they could show Heather our pieces. Are you kidding? Of course! We assumed the necklaces would enter some black hole, but then in the Chicago airport one day, boom, there is Heather Graham in Instyle magazine wearing our necklace! It is really exciting when that happens. 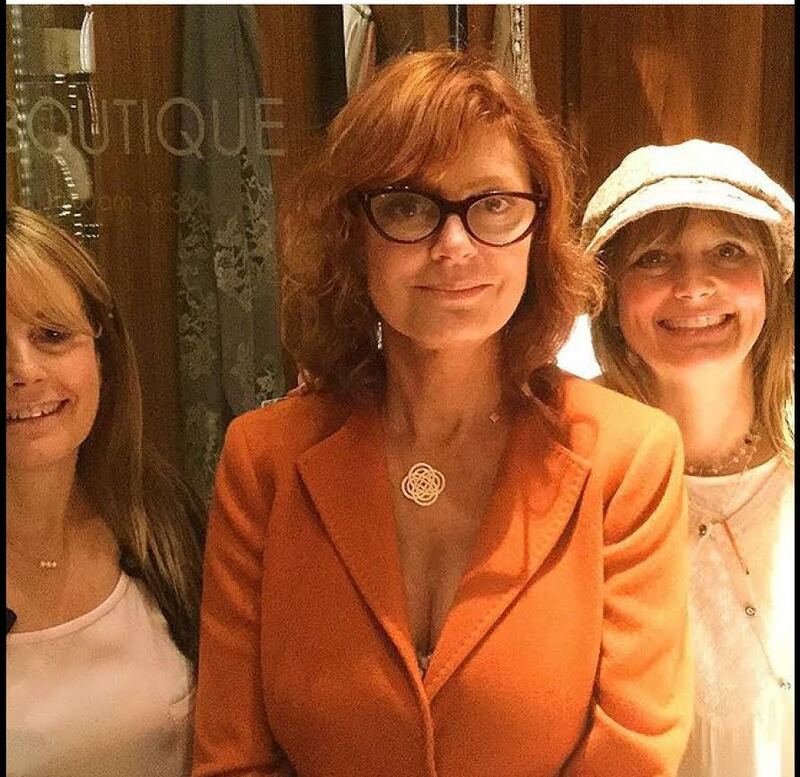 We have another celebrity who is about to wear our jewelry but we can’t say who yet, but we can share that Susan Sarandon just bought one of our heart necklaces! CSC: How do you use social media? 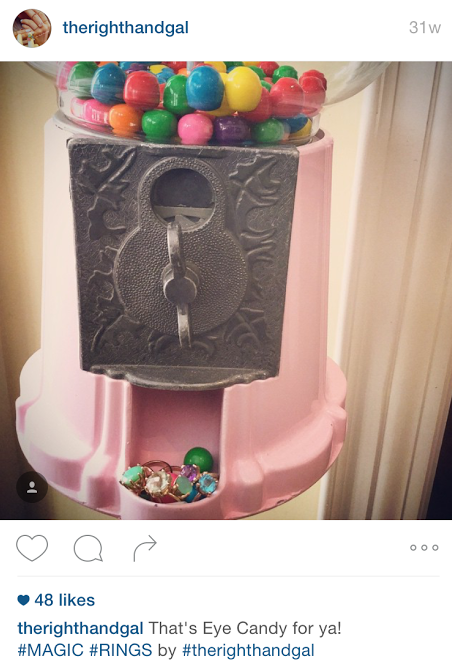 RHG: We are serious about our business but we try to show our fun and crazy side on Instagram. It isn’t about showing off, or excluding people, it’s about sharing the effortless chic that is our brand, and being open. 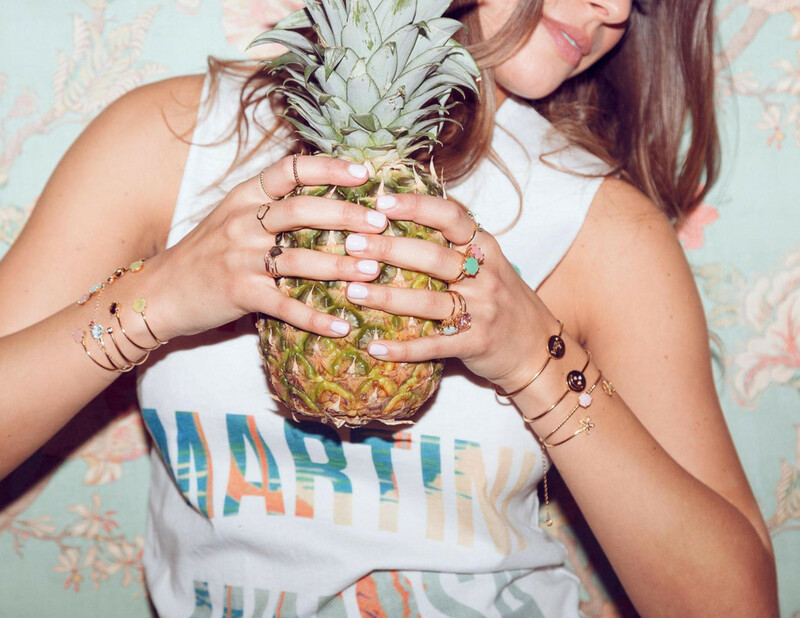 We love seeing others express a part of themself with our jewelry! It makes us happy if we can help make women feel beautiful. 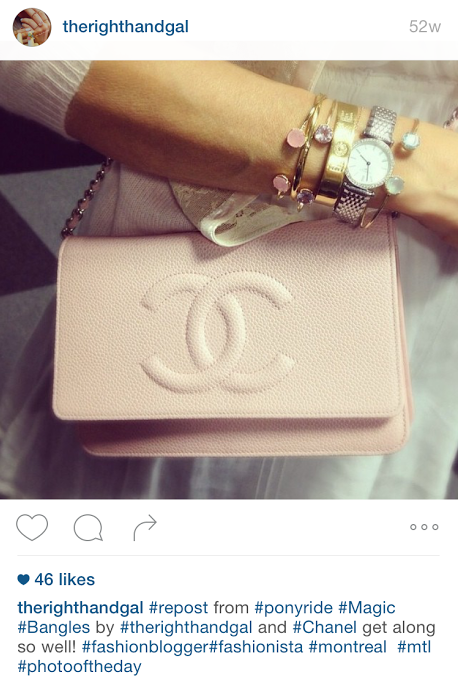 CSC: Where in Montreal / Toronto can we purchase The Right Hand Gal jewelry, apart from JAMES on Sherbrooke Street? RHG: Billie Boutique on Laurier and the Four Seasons in Toronto. We are starting to become available in stores in more and more cities! You can also purchase our jewelry directly on our website. CSC: Any advice for entrepreneurs? RHG: Work hard, stay focused, and take it seriously. There are no shortcuts. And don’t give up. CSC: Favorite travel destination and why? RHG: Italy! Hands down. It’s incredible. There are so many beautiful towns that you don’t often hear about. Stay tuned for their “secret” holiday collection featuring a really beautiful and important message. Thank you gals! I can’t wait to hear more soon! All photos provided with permission from The Right Hand Gal. All taken from their website. Thank you so much for this great interview. You are such a doll and we loved chatting with you. It is wonderful people like you Angelique, who bring even more sparkle to our very sparkly jewelry line!!! Your blog is beautiful…..so keep up the great work!!! Thank you for loving our jewels!! !l xoxo Randi & Shawna …The Gals!